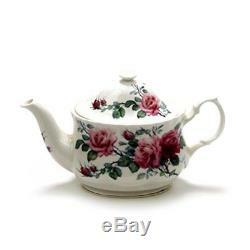 Roy Kirkham English Roses Teapot, Breakfast Tea Cup and Saucer Set Fine Bone China. English Rose Teapot Set includes one 3 Cup(20 ounce) teapot, 2 cups, and 2 saucers, all featuring a bold rose pattern on a white bone china background. What a lovely way to share tea with a friend! The set in made by Heirloom china and imported from England. This lovely, elegant rose set is crafted from fine bone china. By Roy Kirkham decorated with blowing rose and is a stylish way to enjoy your favorite cup of coffee or tea, will delight rose lovers everywhere. This exquisite set features featuring a lush, pink rose blossom and a saucer featuring a high detailed red rose blossom and stem. What a wonderful gift idea for any woman with elegant style and taste. Pink and burgundy roses with green leaves and stems on a white background. INCLUDES:1 TEAPOT, 2 CUPS AND 2 SAUCERS. 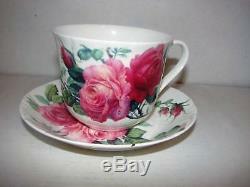 English Rose fine bone china breakfast cup and saucer set. Size: 4.25"D cup, 6.75"D saucer, stands at 3.75H. Cup capacity: 450 ml About 15.5 oz. Size: 9" Wide, 5-1/2" High. Chip resistant fine bone china with an elegant translucent finish. 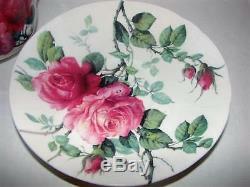 Includes saucer with matching rose pattern. Several processes are involved in the making of bone china, but the ingredient that sets it apart from porcelain is that bone ash is added during the manufacturing of the piece. This makes the piece lighter and more translucent than porcelain. The processing of bone china is more elaborate and more expensive than other types of china, so the price is reflective of this more extensive process. This process also gives bone china mugs. Their thin rims and makes sipping a cup of tea more enjoyable. It is easy to tell if your piece is bone china or porcelain. Simple hold it up to the light and it will have a white, translucent look if it is bone china. Bone china undergoes two firing processes. The first makes the product shrink causing about 20% of the pieces to break. The second firing happens after the piece is glazed to melt the glaze onto the piece. Those that do not crack or break during this stage are decorated with their final patterns. The decoration can be hand painted, sprayed or decals are applied. Many pieces have gold, silvered, or colored paint applied to the rim. And International to Europe, Japan and Canada. Our goal is to ensure complete satisfaction with our products. Except in instances where the item delivered was in error or was faulty or damaged, the customer is responsible for the expense of returning the goods to us.. The item "ROY KIRKHAM ENGLISH ROSE CUP & TEAPOT SET/3 MADE IN ENGLAND FINE BONE CHINA NEW" is in sale since Monday, March 19, 2018. This item is in the category "Home & Garden\Kitchen, Dining & Bar\Dinnerware & Serving Dishes\Teapots". The seller is "carolinajewslim" and is located in Cornelius, North Carolina. This item can be shipped to United States, all countries in Europe, Canada, Australia, Japan, South Korea, Indonesia, Taiwan, South africa, Thailand, Hong Kong, Israel, Mexico, New Zealand, Philippines, Singapore, Saudi arabia, United arab emirates, Qatar, Kuwait, Bahrain, Malaysia, Brazil, Chile, Colombia, Costa rica, Dominican republic, Panama, Trinidad and tobago, Guatemala, El salvador, Honduras, Jamaica, Antigua and barbuda, Aruba, Belize, Dominica, Grenada, Saint kitts and nevis, Saint lucia, Montserrat, Turks and caicos islands, Barbados, Bangladesh, Bermuda, Brunei darussalam, Bolivia, Ecuador, Egypt, French guiana, Guadeloupe, Jordan, Cambodia, Cayman islands, Sri lanka, Macao, Martinique, Maldives, Nicaragua, Oman, Peru, Pakistan, Paraguay, Reunion.